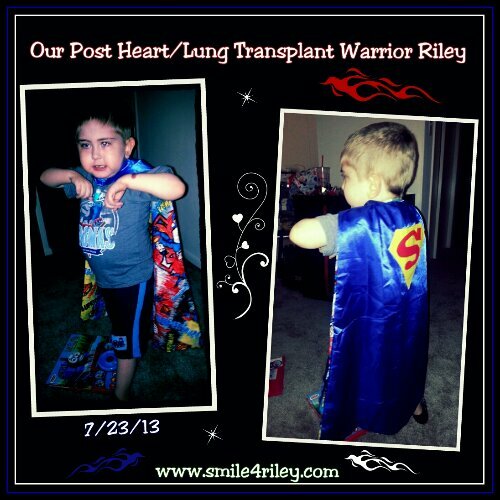 On Wednesday Riley will be having a xray and an ultrasound done on his left leg. 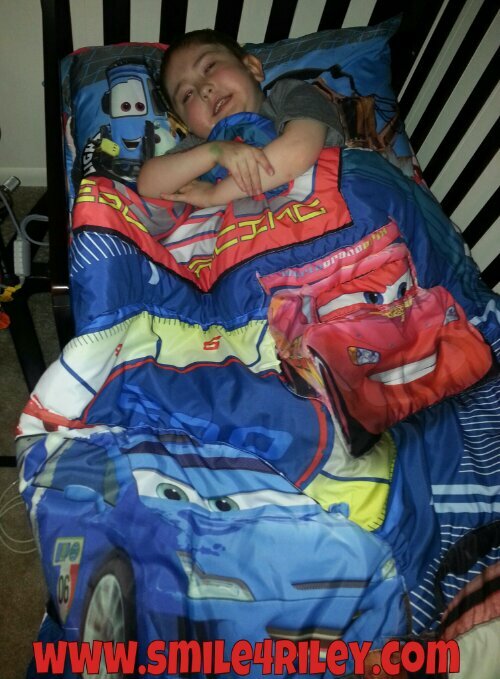 Riley’s PICC line and blood clot were in his left leg. All through therapy his left leg has always needed more rehabilitation. By the time he discharged though it was pretty good. Sometimes we’d have to remind him to point his toes straight but he was walking great .. possibly even better then before transplant. Over the last 2 weeks he has begun to limp. At first it wasn’t all the time but since the weekend it has been constant. He doesn’t want to put weight on it. He doesn’t complain of pain anywhere. If we tell him to point his toes straight .. like before .. He will but he will still limp. This does actually have the possibility of being a few things. Some that could be major issues. Until the test results come back though we won’t know. From there we’ll see where we go. Obviously we pray to God that it’s Nothing! Maybe Riley’s just limping because he wants to! The tests couldn’t be scheduled until late in the day so I’m not sure when/if we’ll have answers but when we do I’ll be sure to update. Riley has survived his labs! It did however go as I expected. Once we got off on the 3rd floor he started Freakin out .. hiding his hands. Regina .. The woman who usually draws Riley’s labs outpatient was so excited to see Riley but she got a screaming child in return. Once we were in the chair I needed the assistance of Riley’s nurse to help restrain him. Trust me .. all the while we are trying to calm him down! Once he saw the butterfly needle go in and the blood start coming out he calmed down. It’s the anticipation of it that gets him so upset. Once it was over he was fine but made sure that everyone saw that he had a band aid. 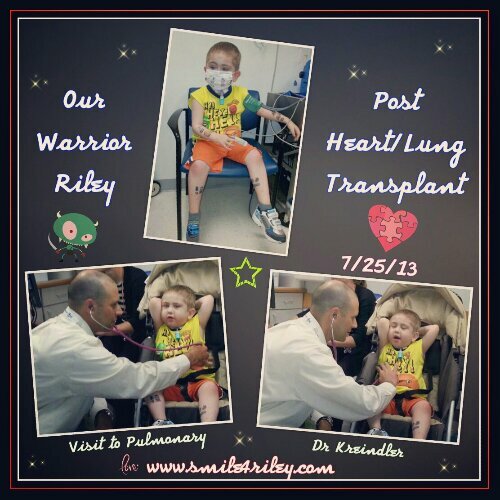 Before Transplant Riley had blood drawn at least every six weeks. Around three and a half he was able to sit in his stroller .. Not on my lap. He would cry some but never put up a fight. Now .. Riley is Completely Traumatized by his Transplant/Post Transplant experience. We will continue to try and work through his anxiety with him. Final note .. All of Riley’s labs looked Good! We’ll Take It! Riley’s labs scheduled for Tuesday had to be rescheduled. There was some nursing confusion because our first 2 weeks of 24 hour nursing was ending today. CHOP requested a continuation of the 24 hour nursing but the insurance company had yet to come back with an answer. Our nursing agency had already agreed to eat the extra 8 hour shift and send 24 hour nursing Tuesday even without an answer from the insurance company but somehow that information never made it to our nurse. Sooo .. Riley has been back to CHOP multiple times since discharge for appts and therapy. Every time he starts Freakin out about getting stuck. Each time we have reassured him that he wasn’t and his visits went fine. Tuesday we head back to CHOP and this time he is having labs drawn! It’s a must and as his parent I completely understand that. The 5yr Old .. Not so much! So not only do we need to get through the blood draw itself .. that inpatient we ended up having to give him PRNs for .. but then have to convince him its Ok to go back to CHOP on Wednesday. An Important thing to know that I don’t believe has been shared yet … Riley has been diagnosed with PTSD. It began when we were still in the CICU and carried over to the PCU. Treatment did begin when we were in the CICU but meds take time. Now Riley is on 2 meds at bedtime to help him sleep through the night and to carry over to the daytime to help with some of his anxiety. That helps with the day to day but when things like Labs or procedures are happening the daily meds do nothing. I have discussed having a PRN at home available and depending how Tuesday goes we may need to revisit the conversation ..
Dr. Kreindler said that Riley’s lungs looked good. We will have adenovirus results tonight or tomorrow and biopsy in a few days. Also there were Minimal secretions. Riley is having another Bronchoscopy in the morning. Dr Kreindler is going to do another biopsy and check the status of the adenovirus. Also Dr Javia is going in to check Riley’s upper airway. This will determine if the trach can be removed. If the upper airway has not improved the plan at this time would be not to look again for a few months.